King Edward VI School Aston in Birmingham held their Festival of Cultures event on the 3rd July 2015. 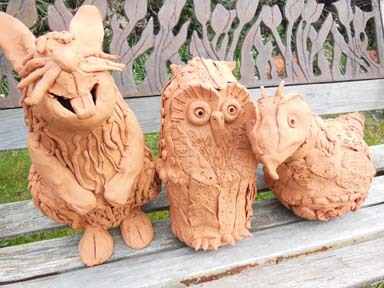 We worked with groups of boys enabling them to realize some of their creative aspirations in clay. 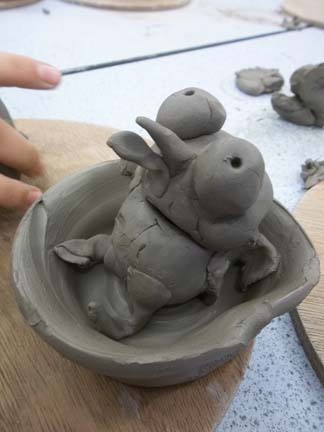 Elmley Castle First School near Evesham Worcester invited Jon the Potter to work with the children to make a collaborative 3D clay sculpture based upon their natural environment and personal interests. Spent an enjoyable and muddy day with the whole of year 6 at Simon de Montfort Middle school . We constructed a huge mud sculpture from sandbags filled with earth in the shape of a giant turtle. The school have an excellent outside space with a pond and brook running through it. For a number of years they have been developing the site and were really excited about adding a mud sculpture to the grounds. Everybody had great fun, even if some students got a little confused about just where they needed to apply the mud! Recently completed x3 creative and fun packed after-school sessions for the students at the Vale of Evesham Special School. We explored pinch-pot, coiling and slab building techniques as well as the potter’s wheel. Loving this goggle eyed chick in it’s ‘nest’ produced on the potter’s wheel. 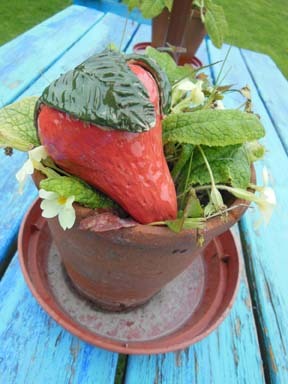 The staff had their go, now it was the children’s turn to create their creative clay consequences! 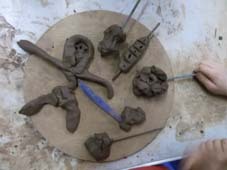 Each child in the school made a section, either a head, torso or legs from terracotta clay. The sections were joined together at random to create crazy hybrid creatures and fantastical figures. Elephant head on a centrepede’s body attached to a mermaid’s tail to give just one example. Once each group had made their clay contribution, there was a little time for the children to play with their remaining clay. I’m always facinated by what they make and wasn’t disappointed either by the variety and complexity of models. Pictured above a clay stick-man, doughnut in a saucepan and a decorated chicken leg. We will publish photos of the 35 collaborative terracotta figures as soon as they emerge from the kiln. 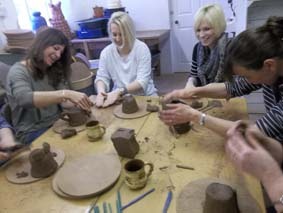 Had a wonderful day yesterday working with the lovely staff from Ashton Under Hill First School here at the Pottery. I’m going to be working with all the children in the school in a couple of weeks time and head teacher Bryony thought it a prudent idea for her staff to get to grips with the clay technology before my visit. There are a selection of photos (minus the x rated ones!) on our facebook page.